Before Christmas, pro-pipeline protesters gathered in Alberta, worried about their jobs and their families. The week before, I was at a protest in Toronto opposing a pipeline in British Columbia because I’m worried about the climate and my family (especially my 4-year-old child). Both pro and anti-pipeline protests have continued into 2019. The people at these competing protests have more in common than we might think. We all want good jobs with decent pay and a chance to raise our families in a safe and beautiful world. And we’re all mad, because we can see that Justin Trudeau’s flowery words are designed to please everyone while his policies let us all down. I want to propose something to pro-pipeline protesters, something that might seem strange at first, so I am asking for you to hear me out. Here is my idea: we have a better chance of shaping a world with decent jobs and a safe climate if we start working together to demand a well-planned transition away from the boom and bust cycles of oil and gas and towards an economy built around stable new jobs in renewable power and energy efficiency. In the United States, they are calling this project The Green New Deal (and a majority of Republicans support it), in Canada it has been called a ‘just transition’ — but the idea of a Green New Deal is starting to catch on here as well. Many people credit the first New Deal — a huge program to put Americans to work building vital infrastructure for their fellow Americans — with helping to ease the United States out of the Great Depression. A carbon tax and dividend might be part of that transition — but on its own, it leaves many individuals and businesses in a lurch without any good job and lifestyle alternatives to turn to. A just transition to a low-carbon economy is both necessary and possible, but workers in the oil and gas industry will have to face the biggest changes. I’ve been in a lot of climate action organizing meetings lately and I can tell you that activists are talking about how to ensure that the men and women working in the oil patch don’t have to suffer. There are young people in our meetings who have moved to Toronto for school or work and they are telling us about their experiences out West, out East, up North – they are telling us that if you don’t get a job with Irving Oil or on a rig or offshore oil platform, you don’t get a job at all. And we hear them, and we talk about the need for new jobs, we talk about the challenges of retraining, we talk about temporary ways to fill in the gaps. Climate justice means respect for indigenous sovereignty and the impacts climate breakdown is having on coastal communities – but it also means justice for oil workers who have worked long hours in thankless jobs so that the rest of us could live a life of luxury. When climate activists fight pipelines or launch divestment campaigns we are not trying to hurt oil workers. The student activists who occupied the offices of Liberal MPs last year are demanding a million new green jobs. The Green New Deal is all about jobs. Climate activists want a just transition, but the only tools available to us are blunt and cheap. We can shout and hold up signs and we can shame oil companies – so we do. If oil companies and the government worked together they could design a low carbon economy that benefits oil and gas workers. But oil companies don’t want to transition. An oil workers’ labour is worth $765 dollars an hour. Are you making $765 an hour? There are real benefits to high labour productivity – but if your goal is to create jobs, it’s not an exciting number. Labour productivity tracks how much you can make off each worker and it gets higher as you automate to reduce your labour force. Most Canadians don’t care too much about profits – if we knew it was just about the profits accumulating in global hedge funds we would have shut down oil and gas expansion years ago. Oil companies are using their workers as human shields while they dig in their heels and fight to hang on as long as possible. And it works, because Canadians know that there are decent people working those jobs and we don’t want to see them suffer. The very real distress of oil and gas workers is being amplified because their feelings are useful to bankers, executives and hedge fund managers who are trying to defend oil sector profitability. Conservative politicians are getting in on the game too. Jason Kenney was recently elected by promising he could turn back time by tearing up environmental regulations and attacking environmentalists — but the global economy is moving on with or without Alberta. Oil and gas workers and oil and gas investors might seem like natural allies – but investors don’t mind boom and bust markets, they can ride it to the top and get out quick with a lot of their profits. Workers on the other hand want stability – they want gradual growth with steady jobs. Global oil markets – especially with climate change looming – are the opposite of stable, they are a roller-coaster of geopolitical risks. Fossil fuels are a thing of the past. We don’t light our homes with whale oil lamps anymore and soon we won’t use crude oil either. Wind and solar get cheaper and cheaper every year. EVs are rapidly gaining market share. Maersk, the world’s largest shipping company, recently declared its entire shipping fleet will be net-zero by 2050. And Canadian Oil workers will also have to come to terms with the fact that EVEN OIL COMPANIES are moving away from unconventional sources like the Tar Sands as they work desperately to reduce their carbon footprints. If the carbon bubble bursts suddenly, it is oil workers who will suffer most. But a just transition can be good for the planet and good for oil workers. Jobs in a low-carbon economy will be more stable because they won’t be so closely tied to global commodity markets. Jobs in the low-carbon economy will be safer. Jobs in the low-carbon economy will be more evenly distributed because electricity doesn’t ship well. For workers who have travelled to Alberta from the Maritimes and workers who have to choose between spending months away from home and uprooting their family to get closer to new oil fields – this will be good news. Some oil workers are already making this transition. Iron and Earth is a group of oilsands workers committing to increasing their skill set and building renewable energy projects so they will be more adaptable in a changing economy. And the jobs in renewables are real. A partnership of major companies and Alberta First Nations launched a 1.2 billion project to create over 1000 jobs in Fort MacLeod, Medicine Hat and other areas of the province. Many of these jobs don’t even require significant retraining. Both oil well clean-up and geothermal power will create jobs for people who are familiar with drilling technology, a field in which Canadian oil workers lead the world. If oil and gas workers help us plan a just transition, Canada will do a better job of understanding and preparing for the challenges ahead and opportunities ahead. It is still possible to save our economy and our planet while creating hundreds of thousands of new jobs, but if activists like me are forced to choose between our economy and our planet – we will always choose our planet, the cradle of all life. If climate activists must continue to fight alone, we will just keep pounding away with whatever blunt instruments are in reach. As the situation grows more desperate, our tactics will as well. Activists both indigenous and otherwise have fought pipelines before and will continue to do so. And our numbers are growing. Without meaningful climate action from our government, I can easily see large disruptions like those orchestrated by Extinction Rebellion in the UK or Ende Gelände in Germany happening here. We don’t want to spend our days blocking roads and getting yelled at – I would much rather spend time with my child at the park – but many of us will if we have to. So let’s put our heads together and develop a plan for a just transition that meets the needs of both oil and gas workers and climate activists, so we can all go back to spending quality time with the people we love. FURTHER READING: 350.org on a Green New Deal for Canada. This post was cross-posted to Toronto350 — the group where I heard those passionate young people speak about the tensions between climate action and workers in their hometowns whose livelihoods depend on the fossil fuel industry. I deleted some rows about very similar industry to make it clear how profitable oil and gas is compared to sectors like telecom and real estate that we typically think about as profitable. (And I know labour productivity does not exactly equal profitability but in a world where labour is a major input it is an important factor). Excluding one small sector called “Other non-profit institutions serving households” which includes grant-making institutions. Relying on profitable staples without upgrading those commodities is called the ‘resource curse’ or the ‘staples trap’ and it is an idea that goes back at least to Harold Innis’s work on the Canadian fur trade in the 1920s. It is often the right choice for wealthy investors in any given moment, but it’s bad for a nation’s economy. This recent tweet from the stellar climate writer Eric Holthaus pretty much sums up both the mental state and mission statement of Climate Pledge Collective. I wouldn’t personally go so far as to say nothing is working. Climate organizers have had a lot of successes — public perceptions of climate risk are changing rapidly, renewable energy is growing fast, relentless pipeline protests are actually keeping tar sands oil in the ground and divestment campaigns have oil companies running scared. But when we consider the scale of the challenge, these small successes virtually disappear from sight. Eric’s thread careened through a raw and powerful list of climate successes and anxieties and ended on this courageous note. The solutions to our climate crisis exist — I know people who work for the Ontario government who say they could bring emissions close to zero in the province if the government was willing to put up the money and tell them to do it (although freight transport and air travel remain very hard to decarbonize) — the problem is building the policital will to force governments to act. And that requires numbers and determination. It’s not enough that most people are loosely on our side — we are up against something that economists call ‘regulatory capture‘ on a massive scale. We hear a lot about the ‘tragedy of the commons’ — but we should also be aware of the ‘tragedy of the corporation’, a world in which we have created blood-sucking institutions that will defend themselves from regulation even if doing so threatens the future safety of their own employees. Regulatory capture is a common phenomena because businesses, beef farmers for example, care a lot more about cattle regulations than the average person does. They will put up money and make calls and join forces to lobby very, very hard for regulations that protect their profit margins. Fossil fuel companies are spending millions on lobbying and earning billions more in subsidies in return. So what can the climate movement do differently? Why haven’t we succeeded yet? It is my view that we have to recognize that climate change is part of our daily life, just like fossil fuel regulations are part of the daily life of fossil fuel executives. This is not a new idea — important voices on climate twitter like Dr. Vive and Katharine Hayhoe are calling on us to talk climate on a daily basis. Nor am I confidant it is the best idea — part of the path forward has to be different people trying different things — but I think it is worth taking a closer look at how daily life and climate organizing connect — or fail to connect. What does it mean to open up climate organizing to peoples’ daily lives? We don’t think much about this — partly because many activists are rightfully suspicious of proposals that suggest individual actions as a response to a collective problem. But we have to remember that collective action is the statistical and sometimes chaotic sum of billions of individual actions — patterns and customs within daily life shape those actions as much as any individual law ever will. This is not my own insight — it is a common view in relational sociology (see for example Deleuze and Guattari, Anthony Giddens or Eiko Ikegami). Other research shows that social movements like workers’ movements and the civil rights movements are most effective when they are built out of the raw material of people’s daily lives. Manuel Castells’ (1983) work on social movements makes the case that the most successful worker’s movements happened in places where the workers lived close to one another. In particular, he highlights the role of women in organizing strikes and uprisings. When workers lived together, their wives were able to organize their social networks around a common cause, organizing even while they prepared meals, provided childcare or went to the market. Historically, women have done the work of daily life. When women alter their routines, change comes very rapidly. Others have suggested that while racial ghettoes are terrible for many reasons, they have often made the work of political organizing easier. Climate change is an issue that impacts everyone and we need to start organizing along our regular networks — where we are already known and trusted — and during our regular routines — so that we have sufficient TIME to organize. 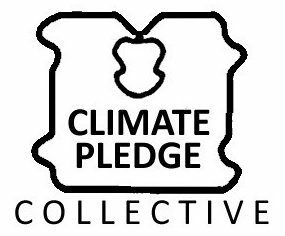 Climate Pledge Collective is committed to finding ways to help people integrate climate action into their daily lives. This is one of the reason our pledge system includes individual choices like food and transportation — because people talk about their daily lives A LOT — and talking about a change like eating less meat or riding a bike is more natural than talking about carbon tax policy or scientific findings. When we change our daily lives, people notice and we seed the ground for more change. One event we’re working on is a campaign to get everyone to email everyone in their contact list about climate on earth day — in the hopes of smashing filter bubbles and tipping the ‘availability cascade’ (see below) further in our favour. I’m also working to find ways to make climate my number one response to stock questions like ‘how are you’ or ‘what have you been up to’ — working on climate a lot makes this easier, but it’s still hard sometimes. Another thing that can help is bringing along a team. At a recent high school reunion, I emailed a few friends in advance and asked them to commit to talking about climate change — together we seeded the room and it felt like every little circle I stepped into was a conversation about climate. People want to talk climate — but they don’t always feel comfortable bringing it up. Bringing up climate change in ordinary situations isn’t always easy — the tyranny of politeness makes it hard to bring up a truth as horrible as our current ecological crisis at a birthday or brunch or water cooler. Small talk won’t be successful right away — but it can gather momentum quickly. The psychologist Daniel Kahneman talks about ‘availability cascades’ — basically, topics we hear about often come to mind more easily — this is why everything connects to climate for people who follow climate news and nothing connects to climate for people who are still safely ensconced in a bubble of pre-chewed infotainment. Once we start breaching the topic of climate change in daily life, others will start thinking about it more often as well and eventually will see the issue in the same way we do. But we have to bring up the issue EVERYWHERE, ALL THE TIME. Movements like Fridays for Future and Extinction Rebellion are working to bring the issue into public space (and I’ve been right there with them here in Toronto) — but we can’t protest all the time — we have daily errands that we must attend to. Luckily, there are many other smaller spaces of daily life that we need to occupy as well. This sign is above my doorbell. It doesn’t have a profound impact, but imagine seeing these three or four times a day? The availability of the topic in the front of your brain would start cascading like a tsunami. And this is my hat. It promotes Climate Pledge Collective’s first in-person event — a day in the park with food and scientists and musicians and climate organizers — which was designed specifically to fit climate organizing in alongside daily needs for nourishment and self-care. Climate Picnic will take up public space, but it will not be oppositional. It will take time, but it will hopefully allow people to also do things they would have done anyway, instead of burning their energy. This is a particularly important point — and one that was explained to me during my Masters’ Degree in Community Development. Most people don’t have time for political organizing, but they need to eat three times a day, so if you can combine organizing with meal times, and especially if you can provide food, you open up a whole world of opportunity. Hats, front door signs and picnics may seem trivial in the face of a problem of this scale, but there are hundreds of millions of people who want action on climate change — if we lower the barriers to participation we can engage them all and then the availability cascade will become an overwhelming flood. Stone Soup — One simple project that I’ve been planning to try, but haven’t found time for, is a vegan stew and climate chat in my home. I will make a few litres of my favourite sweet potato chickpea coconut curry, invite all my neighbours and just talk openly about climate change and climate organizing. Of course, I will be careful to invite a few other people who are supportive of meaningful climate action, so I don’t get swamped by deniers — just as I planned a group approach to my high school reunion. My dream for Climate Pledge Collective is to open a restaurant based on the stone soup idea — it would serve a simple menu of vegan soups and stews, but mostly it would be a climate organizing hot spot — a place that people could drop into for a quick, cheap, healthy meal and receive a side-order of solidarity and climate news or maybe a documentary screening or a music night or a petition or a phone campaign. Imagine getting more involved in the climate movement was as easy as popping into a shop to by a bowl of soup! And from there, once people had a place to connect, it could grow, perhaps also stocking a small selection of ethical, sustainable clothing — meeting more and more of people’s daily needs in a manner that minimized the endless variety of material consumption and highlighted the broad array of weightless, no-footprint cultural products that we truly need to sustain us. If we can combine food, self-care and climate organizing into a single package — we will become an unstoppable cultural force. Castells, M. (1983). The city and the grassroots: a cross-cultural theory of urban social movements (No. 7). Univ of California Press. While one email is easy enough to ignore, imagine getting 3 or 4 honest and heartfelt emails from people you know and trust all raising the issue of climate change, all on the same day. Too often, we worry silently about climate change, not wanting to disrupt the pleasantries of dinner out, kid’s birthday parties or workplace lunches. Unfortunately, climate change is the elephant in the room and we need to start talking about it before it kills us. We do have a few suggestions for your emails though — and we will also be doing a follow up post with some interesting resources on climate communications. SHOW EMOTION: I have noticed that simple images of a human face with a comment about that person’s worries about the future are often the most persuasive and effective climate messages — much more powerful than charts or weather models because they invoke immediate sympathy. So yes, it’s okay to tell the people you know that you are frightened or grieving or confused. Or you can even just say you feel a little guilty because you haven’t been following climate news as closely as you should. BE HONEST: As we said above, you don’t have to pretend to be an expert, just bring up a particular fact or new story that got your attention in the last few months and ask your friends to take a look at it. Maybe it was the fires in California or the IPCC report or the more recent U.N. Report suggesting catastrophic sea level rise is already locked-in. If you are an expert that’s great, share your knowledge in an accessible way! CLOSE WITH A SPECIFIC ASK: The last thing we want to do is bombard people with frightening emails and leave them paralyzed — so introduce a simple next step, maybe it’s offer to listen to their thoughts by phone or go for coffee, perhaps there is a charity or organization that you like which needs funds or volunteers. You could also ask recipients to make one call to one of their representatives or fill out our online pledge. If you are emailing people in Toronto, you can invite them to come out to our Climate Picnic event to learn more — or declare your own Climate Picnic in your home town and invite everyone to come. As Greta says, We don’t need hope, we need action. Because when there is action, hope is everywhere. You might even suggest people watch a Greta Thunberg speech as a simple next step. DOOWUTCHALIKE Like all Climate Pledge Collective projects, how you participate is up to you. Maybe you would rather email only politicians or just your ten best friends. Or maybe you think it would be more effective to write different emails for co-workers and friends and older acquaintances. You’re probably right — go ahead and do it! Last summer, I decided to stop quietly freaking out about the climate crisis and start acting. I don’t know how best to approach such a complex problem — so I’m trying everything, including attending a lot of climate organizing meetings. Here’s what I’ve learned about what these meetings are like and what the groups are focused on. These are first impressions from one point of view, so take them for what they’re worth. 6 Toronto350 Toronto350 is probably the biggest and oldest non-professional climate group in Toronto. They have tons of experience and knowledge, but their big open meetings can sometimes feel a little slow — but that is the cost of taking everyone’s opinion seriously. They are currently redesigning their meetings and org structure though and hoping to develop sub-committees that can make decisions more quickly. Their focus is on pressuring pipelines and banks and promoting indigenous solidarity, but they are open to new ideas and projects. 10 Climate Pledge Collective Right now, the group is just my wife and I (Matt and Myrtle) with some help from friends on specific projects, so we don’t have formal meetings or an intake process. That said, we have lots of ideas that we want to implement — so if you are a self-starter contact us and we will throw our skills and social media presence behind your work. We are currently toying with the idea of a Climate Pledge for Restaurants and organizing Climate Troubadours to sing about climate and hand-out pamphlets in public places as well as organizing our Climate Picnic on May 5 (https://www.facebook.com/events/812559672441011/). Stop, Children. What’s that sound? Everybody look what’s going down. The basic plan is this — we are going to gather in the Southeast corner of Christie Pits Park, bring our signs and songs and musical instruments, and then sit down on the grass and eat while we talk about what we can do about climate change. While protests have their place, this event will be joyful and friendly — we hope everyone walking past will be curious enough to come over and ask what’s going on — and maybe even join us. Bring guitars or drums or games or vegan cupcakes to share. Or just bring your questions and ideas! The first picnic will be May 5 at 11am — but we are hoping to make it monthly, or maybe even weekly. This would also allow us to move around the city! Most people now understand that we have to do something about climate change and we have to do it soon — but what do we do? Individual changes don’t seem sufficient and organizing collective change can be frustrating in the face of so much misinformation. Our climate crisis intertwines issues of equity, gender, food, environmental racism, indigenous sovereignty and daily life. There is no single-solution: it will take different people building different solutions at different scales. We need to make changes in our individual lives — eating less meat and dairy, driving less, flying less — but we also need to organize collective action to support those changes — bike lanes, better transit, renewable energy, new (or older) agricultural practices, macro-economic policies, regulations, divestment and new relationships with each other and our planet. CLIMATE PICNIC is an open invitation to anyone working on climate from any angle — or anyone who simply wants to learn more — to come out and meet like-minded people, build new networks and enjoy low-carbon luxuries like food, music and good weather. If you are part of an organization — anything from a school eco-club to an international environmental organization — we encourage you to come out, bring a sign, flyers or just a short pitch about your group. We organized something similar for the Fridays for Future protest in March and it was a ton of fun. With better weather — we’ll be able to learn more and hang out for longer. Climate Picnic is vegan-friendly. We recommend that you try to bring vegan food, even if you aren’t vegan. I’m not vegan myself, but I have given up red meat and am gradually reducing the amount of meat and dairy I consume. If you end up bringing some leftover sausages or your kid only eats ham sandwiches — that is, of course, totally fine. APIECALYPSE NOW — Toronto’s best Vegan Pizza Joint is right across the street. Can I start a Climate Picnic near my house? Yes please! The wider we spread the better. Email us if you want advice or just do it on your own! Is Climate Picnic only in Toronto? It is for now, but this event is super-easy to replicate. All it takes is one sign or banner, a few picnic blankets and some outreach to people who are already working on climate in your city. If it starts small, that’s okay — Greta Thunberg started by herself and has gone global and completely changed the climate policy discussion in six months. Email us at contact [at] climatepledgecollective.org if you have any questions — but feel free to use the name, concept, anything you like. We’re a no-ego organization, if you can spread our ideas farther than we can, do it! Climate Picnic, The Christie Pits and all of Toronto stand on the traditional territory of many nations including the Mississaugas of the Credit, the Anishnabeg, the Chippewa, the Haudenosaunee and the Wendat peoples. Toronto is covered by Treaty 13 with the Mississaugas of the Credit. The territory was also the subject of the Dish With One Spoon Wampum Belt Covenant, an agreement between the Haudenosaunee Confederacy and Confederacy of the Ojibwe and allied nations to peaceably share and care for the resources around the Great Lakes. It is also important to recognize that indigenous history is dynamic and changing — both before and after the arrival of settlers. The Haudenosaunee Confederacy was formed from the Mohawk, Oneida, Onondaga, Cayuga, and Seneca nation by the Great Law of Peace (Kayanerenkó:wa) which preceded and influenced the U.S. Constitution — although “some Haudenosaunee say that, in imitating the Great Law, the United States did so poorly, for their constitution neglects some of the most important aspects: peace, the Good Mind, obligations to the natural world, the importance of families, obligations to future generations, spirituality, respect for women.”(Williams, 2018). We also encourage Climate Picnic visitors to visit Nish Dish, just down the block from Christie Pits, before or after the picnic in order to get a taste of contemporary indigenous traditions. Williams, K. P. (2018). Kayanerenkó: wa: The Great Law of Peace. Univ. of Manitoba Press. We should consider nuclear power, but advocates shouldn’t pretend it’s perfect. Lately, it feels like half the discussions about climate change I encounter online devolve into a shouting match about nuclear power between those who support it and those who oppose it, neither of whom are taking a balanced view of the issue. Instead, as in most situations where intelligent people disagree, advocates and opponents have both latched onto real and convincing evidence on one side or the other and closed their minds to the contradictory facts. Nuclear power for example, does not solve our problems in one fell-swoop — concrete, land-use, animal agriculture, etc. are all separate problems that still need to be addressed. Nuclear power is still the cheapest low-emissions form of power. People who want to see all solar and wind will tell you that nuclear is far more expensive than wind and solar, I myself made this point to a friend who is an electrical engineer working on decarbonization policy for the Ontario government. While wind is cheaper per kw/hr if you only look at the base price, creating a functioning electrical system with only wind is more expensive for a number of reasons. 1) Wind power is variable, so if you want to have a steady supply for a million houses, you might need to build wind power for two or three million houses to ensure there is power on quiet days. 2) Wind power (and especially solar power) need batteries and, after including the price of batteries, nuclear is considerably cheaper. Building gigantic batteries all over the world will also have negative environmental impacts of their own. But it’s not sooo much cheaper that we shouldn’t take a hard look at paying more for electricity to avoid nuclear’s downside. 2. Nuclear power creates radioactive waste and radioactive waste is a big gamble. Although nuclear advocates will tell you that next generation reactors are perfectly safe, nothing is perfect. All aspects of the nuclear power supply chain create risks — uranium mining and processing, shipping fuel, collecting waste, storing waste. It is possible to design safe nuclear supply chains, but nuclear waste lasts effectively forever and the safety of nuclear power assumes a stable enough system of government to preserve safe-handling practices almost perpetually. As good as engineers may be at calculating physical risks — our political and sociological prediction skills are extremely poor. My father, who is an environmental political scientist, was part of a committee trying to design safer nuclear waste handling practices about ten years ago and one of the main sticking points was the question — how do we store nuclear waste and mark that storage so that humans ten thousand years from now, speaking languages we have not yet heard, living in cultures we cannot imagine, don’t dig it up out of curiousity. There was serious thought given to not marking it in anyway, because people love to dig up the ruins of ancient cultures. Creating nuclear power supply chains all around the world also increases the chances of rogue nuclear weapons becoming a reality. Climate change is however more dangerous, more imminent and more certain than nuclear disaster — so it is worth considering if nuclear power is the lesser of two evils. My personal view is that nuclear power should be included in the range of tools that we consider to slow our climate crisis — but that anyone who tells you it is a silver bullet is deluding themselves. So let’s talk about nuclear power, but let’s all admit that it is a complex question with no obvious answer first. My personal view is that we should probably pay more for renewables — but I’m not an expert and I’m open to being persuaded on this issue by people who know more about the real costs and benefits involved.